All registrations are to be submitted via Comet. 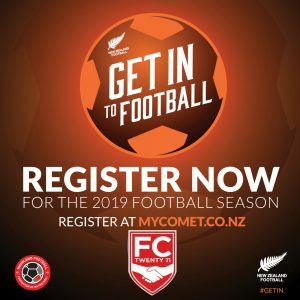 Comet is the New Zealand Football registration system for all football clubs in New Zealand. If you are new to the New Zealand Football registration system, please register as a new player. If you have previously played and cannot recall your 7-digit username, please contact Melissa via melissalgreen@outlook.com. Earlybird discounts apply to registration and payments received on or prior to the 17th March 2019. Please ensure the players name is included in the reference section. Please note: FC Twenty11 reserves the right to withdraw a player’s registration due to no or insufficient payment being received prior to the 6th April 2019. All First Kicks, Fun Football and Juniors (Grade 9-11) will receive an email from FC Twenty11 confirming key details required for the 2019 Football Season. If you have not received this email, please check your email spam folder, then contact Melissa via melissalgreen@outlook.com. Please note: First Kicks and Fun Football is all about developing the kids confidence, skill and love of the game. Players will not be graded prior to the season commencing. We also welcome parents and guardians to get involved. Help with a drill, a game or words of encouragement from the sideline. Trials for Junior (Grade 9-12) and Youth (Grade 13-17) will be conducted prior to the 2019 Football season commencing. As such, please ensure you child has been registered prior to attending the grading session. The date, time and location of trial sessions can be found on the respective web pages (click on Junior and Youth links). Where possible Ollie Hawkins (FC Twenty11 Football Development Manager) will conduct the trial sessions himself. In some cases, prior club coaches will be asked to assist in conducting these sessions. Ollie Hawkins will have the final say on team allocations. At the completion of the trial session/s, Ollie Hawkins will notify all players of their team allocation, coach and register the teams with Mainland Football required no later than 8th April 2019. Please follow the above registration process.